Please accept my obeisances All glories to your Divine Grace!!! I remember one of the first times I came into contact with devotees was in Chicago's O'hare airport. I was on a stopover and went into the terminal to kill some time. A devotee came up to me and put Bhagavad Gita As It Is in my hands. I remember when I saw the Sanskrit I was very intrigued and wanted to read some of it, but then the devotee turned to the pictures and flipped through them as he talked to me. I remember very much that I wanted that book. I felt instinctively that there was something in there that was valuable, ancient wisdom handed down untainted by the author's personal motivations. As it was I didn't have enough money for the Bhagavad Gita that day. I am very grateful that Krsna gives many chances for one to become Krsna conscious, and I ended up with a copy of that book that I so desired. It is one of my most cherished possessions. It is always available for me as a touchstone of pure knowledge to give me peace in times of distress. 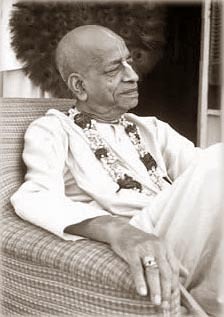 Because of you Srila Prabhupada I know what is right and what is wrong, what is good and what is bad, and more importantly, what is the process of self-realization in this age. I may struggle with living up to the high standard of truth you have given, but I know it is, in fact, the absolute truth, and that the wanting is with me and not with what you have given. Thank you for your books Srila Prabhupada. They have given me life. They have given me hope. They have given me a purpose. They are truly the gems of literature. Nothing else comes close. On this day of your appearance I am reminded of the truly great gift you have given to the world. I am always in your debt, and will always try to in turn help others become Krsna conscious. "Oh my Lord, when will my eyes be decorated with tears of love flowing constantly when I chant Your holy name? When will my voice choke up, and the hairs on my body stand on end as I chant Your holy names?"